"The solution isn't to do away with dreaming and positive thinking. Rather, it's making the most of our fantasies by brushing them up against the very thing most of us are taught to ignore or diminish: the obstacles that stand in our way." So often in our day-to-day lives we're inundated with advice to "think positively." From pop music to political speeches to commercials, the general message is the same: look on the bright side, be optimistic in the face of adversity, and focus on your dreams. And whether we're trying to motivate ourselves to lose weight, snag a promotion at work, or run a marathon, we're told time and time again that focusing on fulfilling our wishes will make them come true. 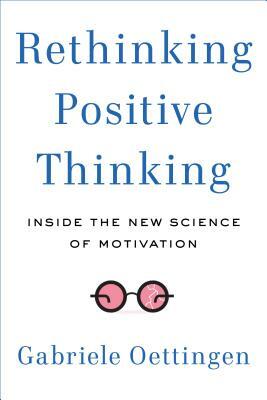 Gabriele Oettingen draws on more than twenty years of research in the science of human motivation to reveal why the conventional wisdom falls short. The obstacles that we think prevent us from realizing our deepest wishes can actually lead to their fulfillment. Starry-eyed dreaming isn't all it's cracked up to be, and as it turns out, dreamers are not often doers. Based on her groundbreaking research and large-scale scientific studies, Oettingen introduces a new way to visualize the future, called mental contrasting. It combines focusing on our dreams with visualizing the obstacles that stand in our way. By experiencing our dreams in our minds and facing reality we can address our fears, make concrete plans, and gain energy to take action. In Rethinking Positive Thinking, Oettingen applies mental contrasting to three key areas of personal change-- becoming healthier, nurturing personal and professional relationships, and performing better at work. She introduces readers to the key phases of mental contrasting using a proven four-step process called WOOP--Wish, Outcome, Obstacle, Plan--and offers advice and exercises on how to best apply this method to daily life. Through mental contrasting, people in Oettingen's studies have become significantly more motivated to quit smoking, lose weight, get better grades, sustain fulfilling relationships, and negotiate more effectively in business situations. Gabriele Oettingen is a professor of psychology at New York University and the University of Hamburg and the author of more than a hundred articles and book chapters on the effects of future thought on cognition, emotion, and behavior. She lives in New York City and in Hamburg, Germany.